If there is a city in Poland that’s unique, it has to be Wroclaw. First of all, it’s a challenge to get the city’s name right. Pronounced as ‘Vrots Wahf’, it takes a while to pronounce the name at least close to right. Until then, you’ll have to take the gentle chiding by the city dwellers. And once you get to the heart of the town, the magnificent island, postcard-perfect old town, the seemingly ever-energetic students, and all the colours will enchant you. So in a day or two, Wroclaw has you. By the time you head home, it’ll be one of the cities of Poland that you would vow to come back. 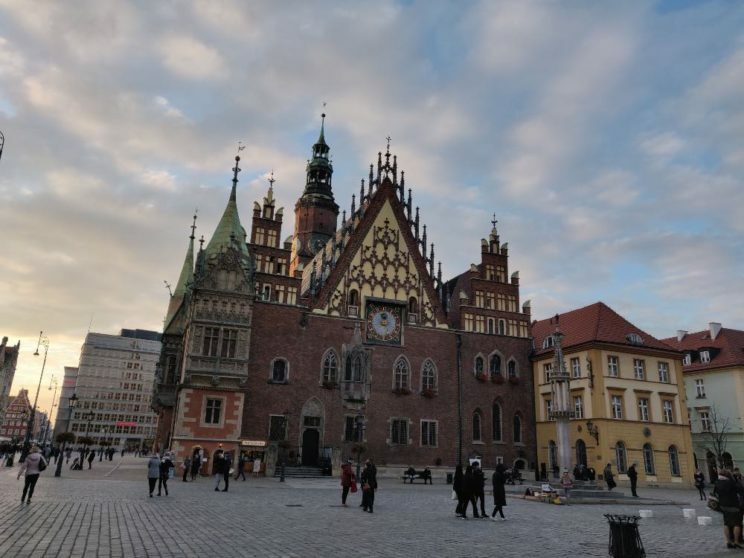 In this Wroclaw travel guide, I am going to show how you can fall in love with the city bit-by-bit, taking you through some of the awesome things to do in Wroclaw. How many days in Wroclaw? Everyone traveling to Poland would have Krakow and Warsaw on their itineraries, but many skip Wroclaw, and I thought of the same at first too. I changed my mind later. I am so glad I did because I ended up loving Wroclaw. If you are looking for reasons to visit Wroclaw, let me share some. Wroclaw is colourful and pretty – Wroclaw is not as crowded as the other cities, and hence you might enjoy the city if you prefer fewer crowds. Plus, the heart of Wrocław, Rynek, medieval market square, is one of the beautiful squares not only in Poland but in Europe maybe. Obviously, this should be one of the places to visit in Wroclaw. Not that the other towns in Poland are not vibrant, but Wroclaw is one level above when it comes to being pretty. I guess much of it goes to the islands, especially the Cathedral island, the Oder river and the old town area. 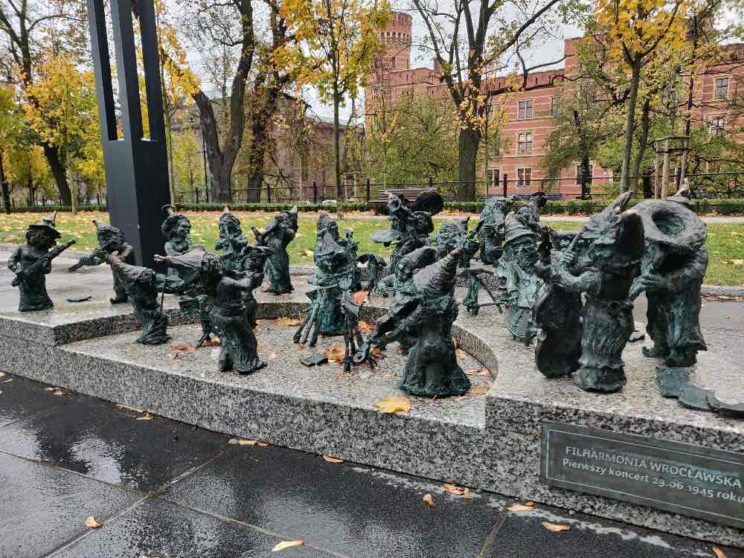 Wroclaw is a city of Dwarfs – More on the details below, but Wroclaw is unique, thanks to more than 400 dwarf statues inhabiting the city. Wroclaw is a city of youth – My Wroclaw walking tour guide told that Wroclaw is home to more than 2 million students. As such, the city carries the energy of the bustling students hanging around adding fun – whether in local streets, cafes or bars, making Wroclaw interesting enough. Probably, this is also what makes Wroclaw a cultural and intellectual hub. Wroclaw is cosy and compact – Not only is Wroclaw lively and modern, but it’s also cosy to travel, hang out and explore, most of it on foot. Wroclaw is cheap – Just like everywhere else in Poland, Wroclaw is quite affordable and easy on pockets for travelers. Wroclaw is home to more than 100 bridges – Okay, this may not or may not entice you, but imagine pretty little bridges across the river, across streets offering plenty of places to walk or simply relax! I guess I have convinced you at least a bit to make sound Wroclaw interesting. Now that you got an idea of what to do in Wroclaw, let me share more on all of Wroclaw attractions. One of the obvious things that you would be doing is to explore market square, which is the heart of the town. Declared as one of the most beautiful market squares in Europe, this is the second largest market square in Poland after the Main Square in Krakow. The Gothic Town Hall with a 66m high clock tower is a sight to enjoy. The monument of Alexander Fedro is popular among the tourists as the photo stop. The Cloth Hall cannot be missed with its rows of shops set in a total medieval architecture. But what I loved the most is how this historical centre is a modern, chic neighbourhood. Some of the best Wroclaw hotels, cafes, pubs, shops and restaurants are located here. I just checked out the parallel streets running around the square, and these cobbled streets are as lovely as the market square itself. 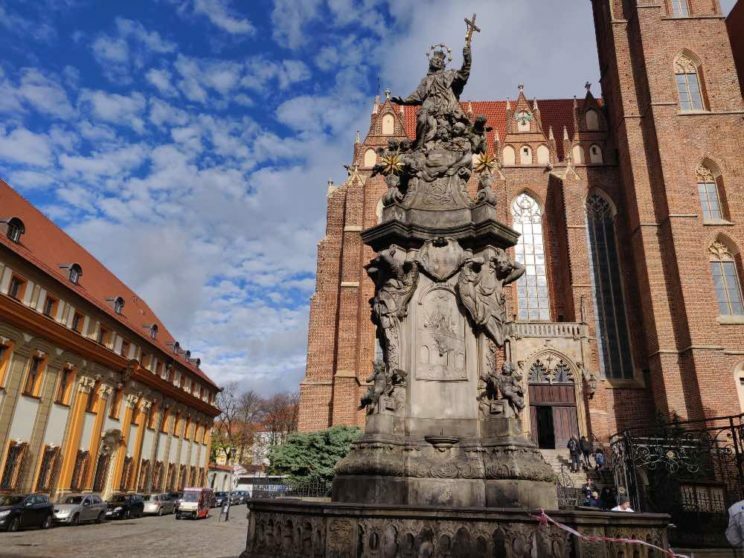 If you want to know more about Wroclaw tourist attractions, it’s best that you first head to Wroclaw tourism office in this part of the town, where you could get a free tourist map of Wroclaw with all the details. If you are looking for some great guided tours, check these below. Wroclaw is synonymous with Ostrów Tumski, the oldest part of the city with a history dating back to the 10th century. As soon as you exit the old town, the pretty Oder river beckons to unveil its other side. Cross the bridge(famous as the lover’s bridge) to stroll the cobbled streets lined with old traditional gas lamps. Did you know? This is the only place in the city where a lamplighter lights these gas lamps manually every evening. What catches your senses would be the splendid Gothic Cathedral with its spires. Get lost in time as you walk past the oldest building of the city – the church of St Giles, Archdiocese Museum, manicured gardens and the bridges. Another thing which you could only do in Wroclaw is to look for the gnomes. Going dwarf hunting is one of the best Wroclaw activities that I enjoyed a lot. To give you a background, Wroclaw is home to more than 350 dwarf statues that are found in the most unusual places that you could expect them. Why were there made? They were symbols of fun as well as peaceful resistance as a part of the solidarity movement against the communist regime. This movement even had a name, called the Orange Underground. Today, gnome hunting is one of the fun things to do in Wroclaw. Wroclaw gnomes are not very difficult to find once you understand where to find them. To help you get started with gnome hunting, head to the Wroclaw tourist information centre and grab a copy of Wroclaw dwarfs map. Download the Wroclaw dwarfs map in pdf format here. Or if you prefer less work, then join a dwarf tour to find them with an expert guide. As a part of a free walking tour, I went to Hala Targowa, which is the city’s local market. This market has everything in one place – from souvenirs, vegetables, cafes, local food to groceries, meat and flowers. If local markets interest you, you know where to head to while in Wroclaw. Listed as UNESCO World Heritage Site in 2006, Hala Stulecia or the Centennial Hall Wroclaw is a tribute to the fascinating combination of traditional and modern architecture. The 65m dome looks befitting at the centre of the hall, which was initially built to host trade fairs. Many musical concerts are held here now. Hala Stulecia is one of the best things to see in Wroclaw. Constructed during the early 17th century, Wroclaw University is what makes the students from all over the world to Wroclaw. Not only does the university boasts of a rich history, but its location amidst the beautiful traditional buildings in the old town also makes it further interesting. This exquisite Baroque-style designed university has given 9 Nobel prize winners to the world. Check out the Oratorium Marianum music hall, Mathematical tower and the Leopoldinum Hall, the best parts of Wroclaw University. The Wrocław Zoo is the oldest and the largest zoo in Poland. With more than 10,000 animals belonging to 1000+ species, The Zoo is also the third largest zoo in the world. You can easily spend half a day at least here, watching the variety of animals inhabiting. If you are traveling with kids, you should definitely add it to your list of Wroclaw sights. If you are in Wroclaw during summer, don’t forget to check out the Wrocław Fountain, a multimedia musical fountain and an ornamental pond. During the summer months between May to October, there are music, light and water shows depicting various folklore, history and cultural stories. Even better if you are visiting on weekends as there are brilliant light shows as well. The best part is you can watch them for free! Check out more details about the fountain here. 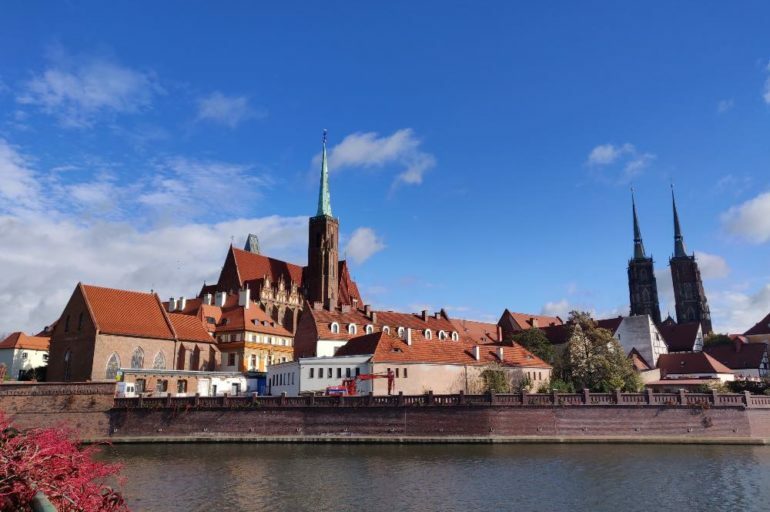 If you have more time or if you want to explore off the beaten track, then here are some more things for your Wroclaw sightseeing. The Battle of Racławice, an uprising against Russia in the late 18th century, is an important event in Polish history. The Panorama Raclawicka is a beautiful painting depicting the same. This massive painting stands out not only because of its size. Due to the unique painting and lighting techniques, which brings out the history through its vivid colours, the painting is a spectacle. Panorama Racławicka timings: Closed on Mondays. 9 AM to 4:30 PM other days. Although it might sound strange, I’d recommend Wroclaw’s main train station as an attraction worth checking out. Painted in an all-bright-yellow, this ancient building is a piece of architecture. It’s almost hard to take it for a railway station, thanks to its fine built. Stop for a while here before you hop on to your city. If you traveling in Wroclaw during summer or just want to do something off the beat, you could indulge in adventurous fun at Aquapark. Aquapark Wroclaw is a theme park with water and land games and is quite popular among the locals. So you might probably hardly find any travelers here. There are various swimming pools, lazy river, Halodarium and Tepidarium, and many kinds of slides. Check the timings and prices on their website here. The other fun activity to try is Trampolim jumping. Popular among the locals as Jump World Wroclaw/ Go Jump Wroclaw, visit this Go Jump Trampoline Park for some fun! Check here for all the details. If you are into Football, you would probably be knowing about this already. Even otherwise, this stadium is worth a visit during your Wrocław trip. The stadium has a capacity of more than 40,000. You might even get lucky to witness a match involving the local team Śląsk Wrocław. The White Stork is the only synagogue in Wrocław, which is a bit obscure to find. It is surrounded by chic cafes and bars today. But history has an important place for this synagogue as this was the place where the Jewish were rounded up and sent to death camps during World War II. Another Wrocław attraction worth checking out is Poland’s tallest building, the Sky Tower. With 51 floors, you can imagine the view that you would get of Wroclaw. Go straight to the public viewing floor on the 49th level to enjoy the skyline and pretty views of Wroclaw. Sky Tower timings: 9 AM to 9 PM every day. If you love street art as I do, you would love Wroclaw’s neighbourhood Nadodrze, north of old town. Hipster Wroclaw comes alive in the form of numerous murals that adorn the walls of the streets, including many neon signs. The wall art is especially vibrant and active because of the young population. You could even head to the Polish Poster Gallery that showcases the history of alternative Wroclaw. The Royal Palace of Wroclaw is home to some of the city’s best attractions, the important one being the Historical Museum of Wrocław. Also called as Wroclaw Museum, it houses the collection including the permanent exhibition – 1000 years of Wroclaw. The Royal Palace timings: Closed on Mondays. 10 AM to 5 PM other days. Entry fees: Free entry to the permanent exhibition at Wroclaw Museum. Temporary exhibition – 15 PLN. On my free walking tour, our guide took us to what looked like a trendy pub. Not only did it look so lovely with its medieval look, but the pub also included a courtyard! As we all wondered, he announced that we had arrived at Wroclaw’s old prison. A medieval prison for notorious offenders in the 14th century, this place is now one of the coolest places to hang out, especially for the university students, thanks to its proximity. If you have a good eye, you’ll also spot a dwarf in jail. How about visiting a medieval post office? Now known as Wroclaw Telecommunication Museum, this place is where the postal service in Poland was kickstarted, way back in the 16th century. How cool is that, right? Wroclaw Telecommunication Museum timings: Closed on Mondays. 10 AM to 4 PM. Entry fees: Regular – 10 PLN; Reduced – 8 PLN. On Saturdays, admission is free. 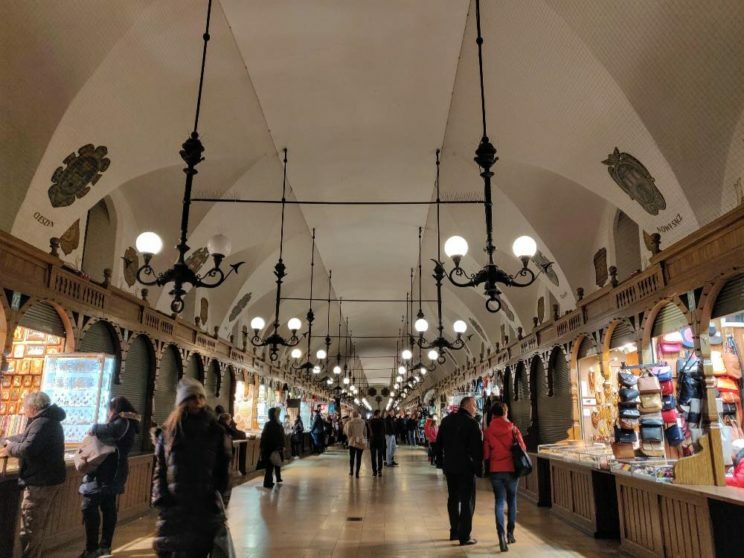 One of the best places to shop in Wroclaw is Dominikanska Gallery, which is so huge that you could easily spend almost a day! Wroclaw is home to all kinds of cuisines including Vegan, vegetarian, Turkish or Italian. But what you should not miss trying are all the delicious Polish dishes. Whether you want the cheapest food at local milk bars or indulge in fine dining, Wroclaw has all types of eateries and restaurants for every budget. If you are looking for the milk bars, most of them are around the university. Whether you are traveling on a budget or not, you should try visiting a milk bar for scrumptious Polish food at least once. You pay according to the weight of what you pick, and it’s total value for money. Some of the milkbars that I just loved are Bar Mleczny Miś, MishMash, Mewa, Krowka Bar and Bazylia. The Hydropolis is one of the unique kind of centres in Europe. As their website says, this is a centre to show water from various fascinating perspectives, which they have accomplished through diverse multimedia technologies, interactive installations, faithful replicas and models. You’ll love this interactive museum as it can never bore you. During summer, all the green spaces come alive in Wroclaw. You can find people having picnics amidst the many gardens in the city. Szczytnicki Park, the largest park in the city is the most popular among the parks as well. The Japanese garden is the most visited section in this park, where the Japanese tradition and architecture can be seen. This heritage listed park is home to many beautiful flowers. The other gardens worth checking out are Ossolineum Gardens Wroclaw, Park Juliusza Słowackiego, Parc Południowy and Park Stanislaus Tołpa. Not exactly a park, but Slodowa Island, located in the centre of Wroclaw, is one of the most popular neighbourhoods with cafes and bars. Many festivals occur in this area making it an interesting area to explore. Thanks to the youngsters in the city, the nightlife in Wroclaw is interesting enough for the tourists. It’s not as active as Krakow, but you have enough clubs, bars and pubs serving the best food, alcohol and music. Join night tours like pub crawls if you are not keen on exploring by yourself. Check this 3-Hour Craft Beer Tour or Wroclaw Vodka tasting and culture tour, guided tours by locals. Now you know what to see in Wroclaw, let’s check out how to plan your trip depending on the number of days you intend to travel in the city. The best time to visit Wroclaw is during the summer when you have the sun out as well as the crowd. But I went in Autumn, which was the low season and loved traveling in the city very much. Very less crowd and lesser prices are what I prefer and hence it worked perfectly for me. Wroclaw is one of the cities to explore slowly. I would recommend at least 2 full days although to me it would still be less. I spent around 3.5 days and felt like I didn’t have to rush anywhere. If you have less than 2 days, see below on how to make the most of your trip. Spend the early part of the morning checking the sights in the old town beginning with the market square. Next, head to Cathredal Island and take in the views. Take the first free walking tour which would actually cover these as well as Hala Staga Market. After lunch, go dwarf hunting or check out the Royal Palace or the Centennial Hall. 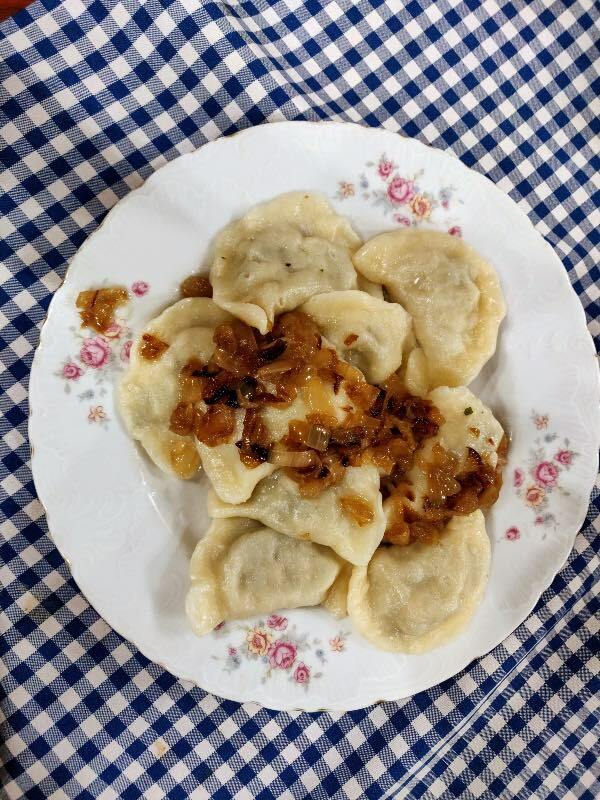 Spend the night savouring the Polish cuisine in one of the local restaurants. You could do all of the above on Day 1 or try to explore a few on the 2nd day. You can visit the Japanese Garden in the evening. Alternatively, if you want to check out museums, head to Wroclaw Museum or visit Wroclaw Zoo if looking to entertain your kids. After dinner, you could take a stroll in the old town if you are still high on energy! An extra 3rd day in Wroclaw would give you ample options. You could choose to do one of the days trips from below or continue checking out the attractions in Wroclaw itself including the islands, Panorama, theme parks and museums. I would recommend going for a day trip as there are many places to visit near Wroclaw. For those seeking to get beyond Wroclaw, there are many day trip attractions. You can even do some of them as day trips by train from Wroclaw. Here are some that you could check out. The Lower Silesia region is itself huge offering plenty for the travelers. You could head to the magnificent Ksiaz Castle, the third largest castle in Poland located amidst a stunning landscape. You could check out Churches of Peace in Jawor in Swidnica. Both of these UNESCO World Heritage Sites could be visited together. You could also visit the Karkonosze Mountains, also known as the Giant Mountains, which is home to the Siedlecin Tower House, a unique mansion and other palaces and gardens. You could also go on hiking in the Karkonoze, where there are trails originating from Szklarska Poręba and Karpacz. One of the most beautiful of all the valleys here is the Sudeten Valley, where you could visit the palaces Pałac Wojanów, Pałac Łomnica and the gardens. The other less-known but very pretty area in the lower Silesia is Kłodzko County. Wander through the lush countryside with medieval palatial buildings, paper mill and gardens. This one is for you if you just want to relax in the countryside without many attractions. This tour is a great option to enjoy the Kłodzko County. You could do all of these basing yourself in one of these places and going on day trips or take multiple lower Silesia day trips to the above. Ideally, both the city of Krakow and Auschwitz need more than a day, but there are tours that would take you through the highlights of both. I feel that Krakow should be definitely explored separately as a destination. I would suggest planning a day trip to Auschwitz from Wroclaw if you don’t plan to cover Krakow. Auschwitz is the place where the most gruesome concentration camps of WW II are located. It’s not a pleasant day trip to take, but history is to be known. However, I would suggest you avoid it if traveling with young children. There are trains and buses from Auschwitz to Wroclaw. Alternatively, you could opt for any of the guided, inclusive tours below. If you are traveling to Krakow, it’s easier and closer to do a day trip to Auschwitz from Krakow as I did. Wieliczka is a UNESCO-protected 13th-century salt mine consisting of subterranean tunnels. Open only during the summer, this underground mine would take you through the deep tunnels leading to the mines and the only underground chapel in the world. A must-visit if you are traveling in summer. Again, it’s closer to Krakow and I would recommend traveling from there if you Krakow is on your itinerary. Check out the splendid old town of Poznan, the Royal imperial route and the medieval churches. Cezar Castle is one of the best places to visit in Poznan. A guided tour would cover all the major sights or you could do one getting on the train or a bus and back. Stolowe Mountains National Park is a great day trip option from Wroclaw for people looking for hike and nature. Beginning from Karlow village, you could trek all the way up to the famous rocky city on top of Szczeliniec Wielki. The views from the highest point are more than rewarding. On the way, make a stop at the Skeleton Chapel in Czermna, built of human skulls and bones. For a guided tour, check this one. Flights: Wroclaw airport is a busy one connecting the city to many of its European neighbouring cities. It’s the easiest and also could be a cheaper option if planned well. 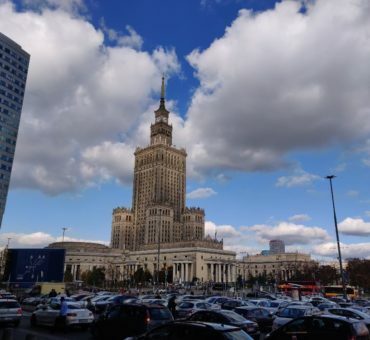 If you are coming from outside of Poland, you could fly to Warsaw and take a bus or a train to Wroclaw. The other way around, flying from Wroclaw to Warsaw also is a feasible option. Trains: For those looking to travel cheaply without compromising on comfort, the train is the way. 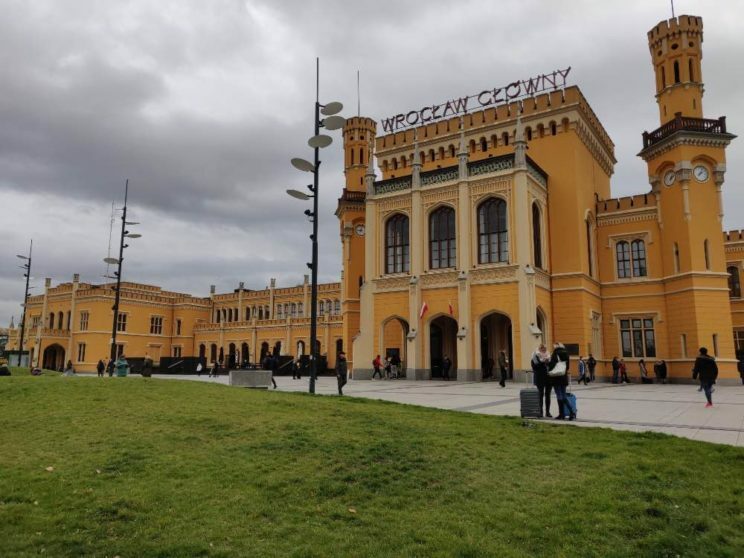 There are excellent train options from Warsaw to Wroclaw, Krakow to Wroclaw or Poznan. There are several types of trains varying in prices. Check them here to book. You could also add Wroclaw as a stopover city while traveling between Prague and Warsaw. Buses: There are buses from the main cities like Dresden, Prague and Berlin to Wroclaw. Within Poland, you could travel to Wroclaw by bus as well. One of the operators includes Flixbus, which run buses to most cities in Europe. Most of the old town area and the islands are best to be explored through walking. If that’s not your preference, then hop on any of those trams or buses. 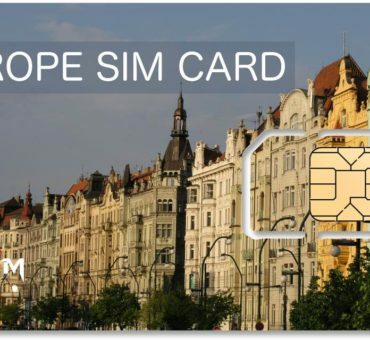 There is Wroclaw transport card that would give you access to all the buses & trams. You can buy these passes at the station. Check more details here. If you are spending more than 2 days and intend to cover most of the attractions, you can probably opt for Wroclaw tourist card. It’s worth buying if you plan to visit Museums and other places with tickets as you would get discounts. However, if you plan to just cover a few attractions or travel on your own, it’s not worth buying. 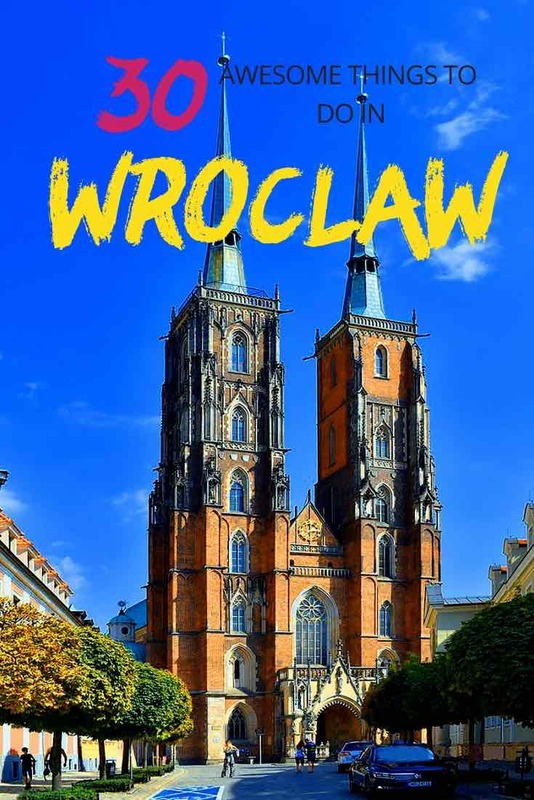 Check the details of Wroclaw travel card to buy here. Wroclaw accommodation comes in all budgets, and hence it’s not easy to find cheap hotels in Wroclaw. Hostels are plenty as well. The central area in Wroclaw is near the old town. This is also where the best hotels in Wroclaw are located. I stayed at ChilliHostel, which was not in the old town but close to it. I liked it as it had all the basic comforts, good Wifi, comfortable and clean beds and a kitchen. So If you are looking for a budget hostel, you could check out Chilli Hostel. Some good mid-range hotels in Wroclaw are CityBrejk Hubska Wrocław, Apartament Piastowska, Apartament24 – Wierzbowa, Apartment City Centre and Aparthotel Tectum. And here are some best Wroclaw hotels with great reviews – The Granary – La Suite Hotel, Scandic Wroclaw, Centrum Dikul Hotel, Hotel Lothus and Hotel Piast Wrocław Centrum. If you prefer apartments, check these – Prestige Apartments 79, Rest Apartments and 40th+ Floor Luxury Apartments in Sky.